You have now successfully configured a number of dedicated IP addresses on SendinBlue. You can create an IP pool from your dedicated IP addresses so that your campaigns can be delivered more quickly and effectively. This is particularly important if you send more than 200,000 emails per day. If, for example, you create an IP pool of 2, your campaigns will be sent at random (50/50) from each IP. This will not be visible to your recipient, who will always see the same sender. However, it will allow your ISP to deliver your campaigns twice as quickly. To set up a dedicated IP pool, login to SendinBlue and go to Advanced settings. In the Your Senders box, click on Configure. 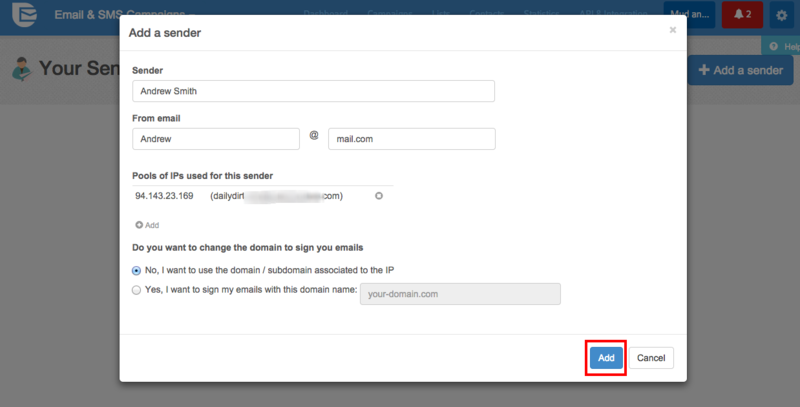 Now you can access the list of your senders and their associated IP addresses. To create an IP pool you need to link several IP addresses to the same sender, which will allow you to send your email packets more quickly. To do this, click on the Manage tab, then on Edit. In the window that opens up, you can edit your chosen sender. 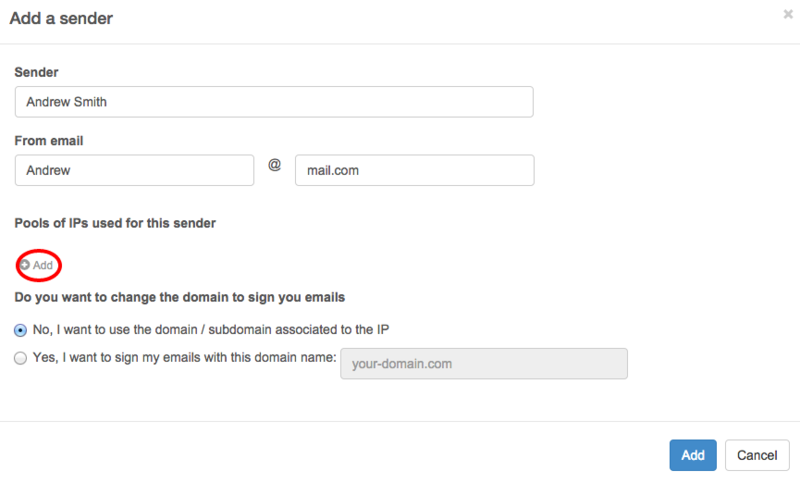 To link a new IP address to this sender and create your IP pool, click on Add. Now select which dedicated IP you would like to link to this sender using the drop-down menu. Then click on Add. The dedicated IP you selected has been added to the list of IP addresses linked to this sender. Finish by clicking on Add. Your IP pool has now been created and from now on your campaign emails will be sent at random by one of the IP addresses in the pool, delivering your campaigns more rapidly. You can also manage weight of your dedicated IPs for each sender, which have more than 1 IP. Click here to read our tutorial.